JOHN LENNON’S LAST DAY has been invited to Berlin for a number of performances at the ACUD Theatre. It will be on over there on June 26th, 27th and 28th. This piece is the most complete account of John Lennon’s last day that has ever been presented. It is a work of ‘documentary theatre’. Basically, with the use of a single actor (Narrator), a simple stage space, some projected images and some very rare audio clips, this piece guides the audience through the strange and tragic events of John Lennon’s last day. It is written and directed by Stephen Kennedy – and will be performed by Seamus Brennan. The play has previously been performed in Dublin at the New Theatre, the Odessa Club, Smock Alley and the Twisted Pepper; and it also sold-out the Black Box Theatre in Belfast; but this will be its first performance outside Ireland. “My work won’t be finished till I’m dead and buried – and I hope that’s a long long time.” -Words spoken by John Lennon on Monday, December 8th, 1980 – just a few hours before his death. Seamus Brennan is an actor from Kilkenny in Ireland. His stage work includes Christ Deliver Us! by Thomas Kilroy (Abbey Theatre) and his TV work includes Love/Hate. Seamus has previously performed John Lennon’s Last Day throughout its sold-out run at the New Theatre (2012) and the Odessa Club (2013). Stephen Kennedy is a writer who has had his work published in the Stinging Fly, Books Ireland, Irish Times, Sunday Tribune, and many other publications. Stephen has been shortlisted for the Hennessy XO Literary Awards and RTE’s PJ O’Connor Awards – and his plays have been performed in Ireland, the UK and the US. His short play Lennon v McCartney was performed a number of times on the main stage of the Adelphi in Liverpool at Beatle Week in 2010. 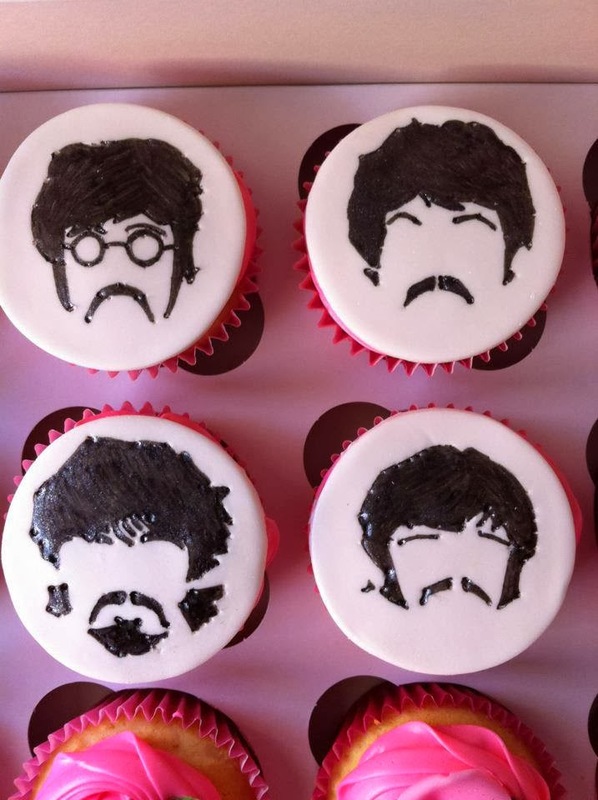 For special occasions, what could be more perfect for a Beatles fan than one of these fabulous cakes?! The Cake Room is based in Liverpool, and specialises in individual bespoke designs. Although the most popular flavour for sponge cakes is vanilla, other flavours are available including chocolate, carrot, lemon, red velvet -- the possibilities are endless (and fruit cakes can also be offered)! Sponge cakes are filled with buttercream and (optional) raspberry jam, and the buttercream is offered in a range of delicious flavours such as vanilla, butterscotch, orange, lemon, coconut, banana, cherry, caramel and champagne. 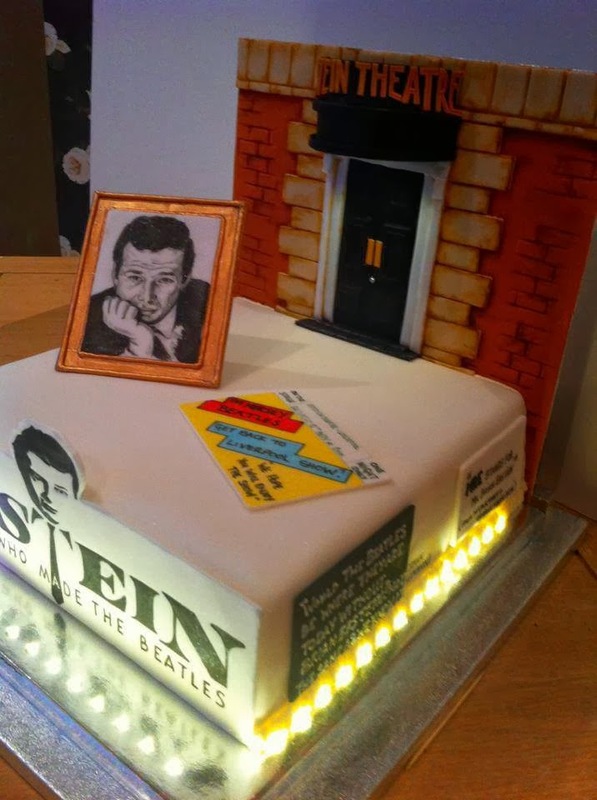 For more of Lisa’s wonderful cakes, including more views of this wonderful cake made in hour of the Epstein Theatre in Liverpool, visit her facebook page HERE! Please note: at the moment, Lisa can only supply cakes in the Liverpool area. Review by Donna Jackson: I ordered one of Lisa's cakes for my dad's birthday last year and it was both beautiful and delicious. The price was very reasonable too. Everyone at his party was impressed! Even if you're not in the Liverpool area, it is worth travelling those few extra miles to collect one of her cakes. I would not order a special cake from anyone else. I absolutely recommend her cakes, and cannot wait for the next special occasion so that I can order another one! The Mersey Beatles Get Back to the Liverpool Naval Club - February 28! 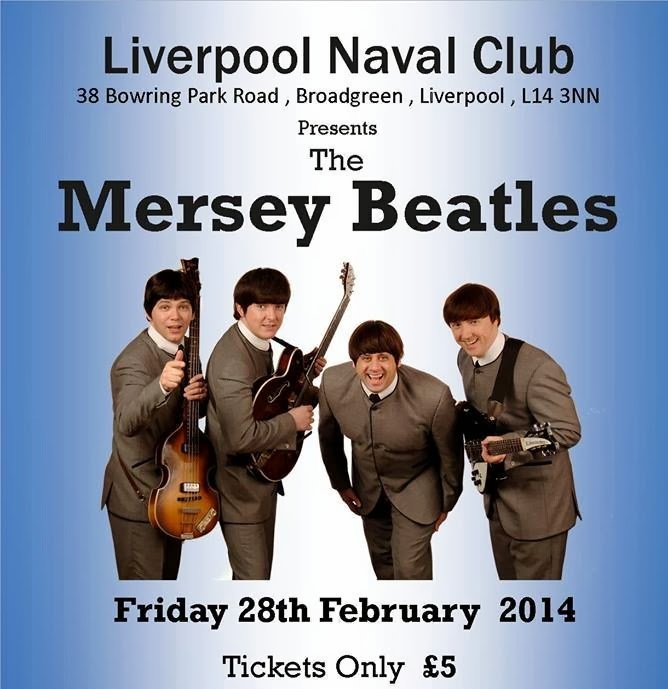 After a sell-out show Last year, the Mersey Beatles will "Get Back to the Navy club" once again on Fri 28th Feb. It'll be a night not to be missed! They know how to get a crowd dancing the night away. The boys will get back to their roots for this, their favourite club gig in Liverpool this year. To make sure you're not disappointed (people had to be turned away at the last gig! ), get your tickets now! We have added a new feature to our website - an events calendar. Now we need more events added. If you know of any or you are part of a tribute band and you want your gigs added, just look at the format and use the email link on the page to send us the events to add in an Excel file! Hard to believe it’s been two decades since Charlie Landsborough first shot to fame with ‘What Colour Is The Wind’, the song that has become his signature tune and still receives regular radio play. Since then it’s been quite a journey - 27 albums, various singles, awards and accolades, and fans in every corner of the globe. To commemorate his 20 years since the release of that landmark song, Charlie is back with ‘Here, There And Everywhere’, a new studio album featuring the great song-writing talents of Sir Paul McCartney, John Lennon and George Harrison. The album takes Charlie back to his home turf, Merseyside, and what better songs to lend his personal touch to than those of his compatriots, The Beatles, particularly given that this year marks a milestone anniversary there too (50 years since The Beatles stormed the USA). “Here, There And Everywhere” follows 2013’s album “Silhouette” making it Charlie’s 28th to date. and some not so obvious, great songs with great arrangements and all performed with his trademark deep, heartfelt and much loved sound. The album title closely aligns itself to Charlie’s faith and belief. On March 14th Charlie heads out on the road again to play selected dates across the UK. The shows come as the sequel to his successful 2013 Tour, with its Amateur Choir Challenge - certain gigs played host to a local choir, all set up by Charlie and all in aid of Children In Need. The new dates see Charlie showcasing material from “Here,There And Everywhere” as well as much loved favourites from the past and more recent album tracks. He is joined by his regular band and the shows promise exceptional evenings of music, good humour and inspirational playing. Charlie Landsborough has recorded albums in Nashville, won many Country music awards and has had his songs covered by various top artists including George Hamilton IV, Daniel O’Donnell, Jack Jones, Pat Boone and Foster & Allen. Tickets to the shows are priced £16.50 - £28 depending on venue (plus booking fee where applicable). Tickets for Hayling Island can only be purchased for the whole three day event. 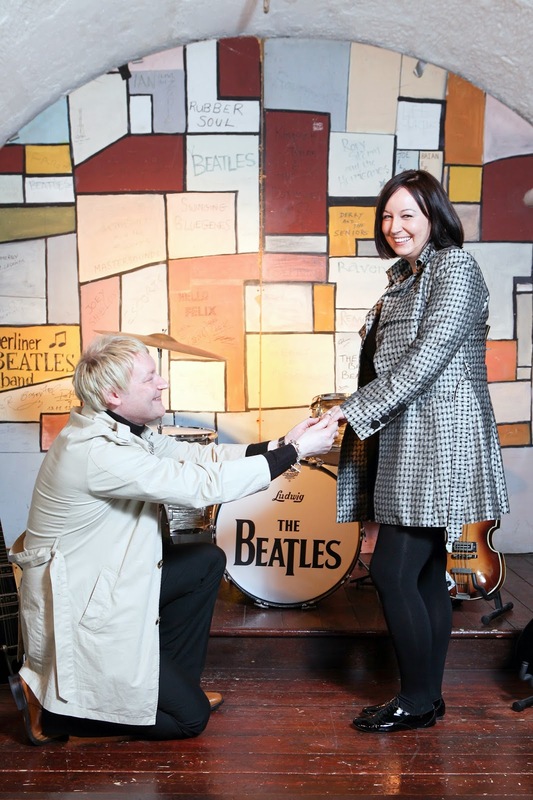 ALL YOU NEED IS LOVE – VALENTINE’S PROPOSAL IN THE BEATLES STORY, LIVERPOOL – AND SHE SAID YES! In honour of Valentine’s Day (14th February), world-famous visitor attraction, the Beatles Story in Liverpool, in the hometown of The Beatles, threw open its doors after hours for FREE for lovers to propose to their beloved. Gavin and Caroline are from the south side of Dublin, Ireland. They met through friends in 2006 at a mod music event. Gavin works in the printing industry and is also a DJ – the Fab Four are always on the turntable. Caroline works in the hotel industry and is also studying in college. Both are massive Beatles fans and have visited the Beatles story many times. When Gavin found out that the Beatles Story were opening their doors to lovers on valentine’s day, it was the opportunity he had been waiting for! After Caroline said yes, the coupled headed to Smugglers Cove for a celebratory cocktail! Staff from the award-winning exhibition were on hand to capture the magic moment with a photograph, celebrating proposals with a bouquet of flowers and a bottle of Champagne on ice. The Beatles Story will be continuing to spread their love with a special two-for-one ‘Love Me Do’ offer*, aimed exclusively at couples across the entire Valentine’s weekend (14th – 16th February). As you would expect from the band that famously sang All You Need Is Love, The Beatles wrote their share of love songs. In fact, The Beatles used the word ‘love’ in their music 613 times. Located in the heart of Liverpool’s Albert Dock - a key part of the city’s UNESCO World Heritage Site along the banks of the River Mersey – The Beatles Story is surrounded by some of the most stunning architectural sights in the UK; perfect for a romantic stroll by the river before having a meal at one of the Dock’s many award-winning restaurants. The Beatles Story is Liverpool’s leading visitor attraction and has won countless awards for its customer experience as well as the content of its exhibition. The exhibition is a chronological tour through the lives and times of The Beatles from their skiffle roots through to Beatlemania and beyond. Each area of the Beatles Story transports people back in time in the lives of The Beatles and it is this immersive quality that will appeal to Beatles fans looking to make an unforgettable marriage proposal in a unique, tasteful and timeless fashion. 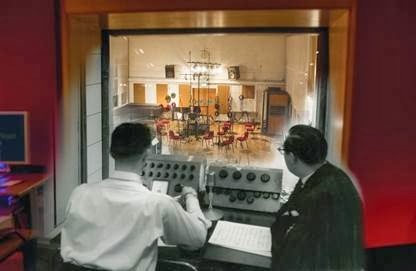 Abbey Road Studios are pleased to announce ‘The Sound of Abbey Road Studios’, the latest instalment in a unique series of public events which will take place in April and May, featuring special guest former Abbey Road Studios Engineer Ken Scott. The entertaining talks mark a fresh opportunity for music lovers and audio technology enthusiasts to visit Abbey Road Studios’ world famous Studio Two where many iconic artists have recorded, including The Beatles, Pink Floyd, Kate Bush, Elton John, Oasis and Adele. Event hosts Brian Kehew and Kevin Ryan, authors of critically acclaimed book Recording the Beatles, return for the third instalment of this fascinating talks series with a brand new lecture exploring the evolution of recording techniques and equipment, many of which were pioneered at Abbey Road Studios. In addition to a multitude of informative and entertaining stories behind these techniques, the lectures will include demonstrations using both new and vintage equipment, some of which has been used on many landmark recordings over the studios’ 82 year history. With Brian and Kevin’s incredible knowledge of Abbey Road Studios’ history and its role in the development of audio production plus Ken’s unique insight into life at the world’s first purpose built recording studios, these talks promise to be a captivating experience for all classical, rock, pop and film score fans. Visitors will have the added bonus of an early entrance time to allow them to explore and take photographs in the famous Studio Two. Ken Scott, Brian Kehew and Kevin Ryan are available for telephone and email interviews. Please note the events will take place in Studio Two only and do not involve a tour of Abbey Road Studios. Admission is £88.40 per ticket, including booking fee. Brian Kehew, co-author of Recording the Beatles, is a record producer, engineer and musician. He has worked with The Who, Air, Rod Stewart, Talking Heads, Aretha Franklin, Black Sabbath, Little Feat, Fleetwood Mac, Ramones, The Pretenders, Morrissey, Alice Cooper and The Stooges. Kevin Ryan, co-author of Recording the Beatles is a Houston-based producer, arranger and composer. He is also a talented graphic designer and video/film artist. The critically-acclaimed, definitive book Recording the Beatles has won huge praise from Abbey Road Studios alumni including Alan Parsons, Norman Smith, Ken Townsend and John Kurlander, whose engineering/production CVs count The Beatles, The Hollies, Pink Floyd, The Pretty Things and the Lord Of The Rings trilogy between them. 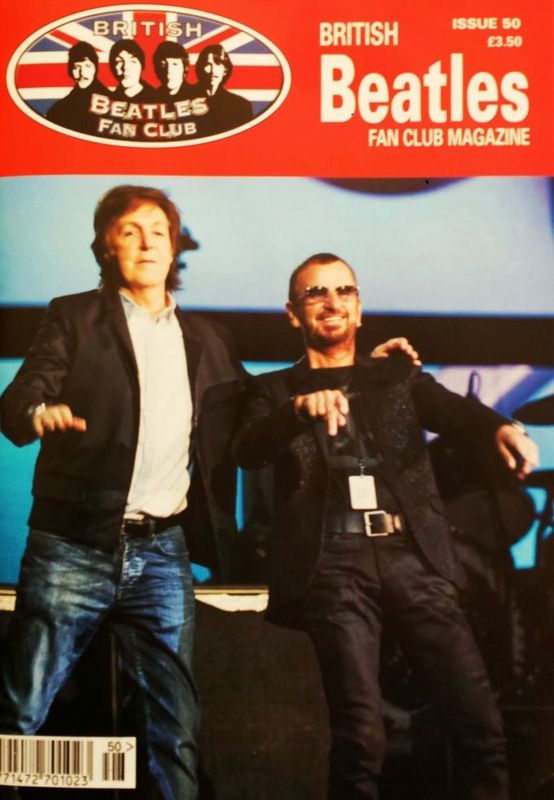 An man indelibly linked to Abbey Road, Ken’s first-rate career began there aged just 16 and has since spanned over 40 years, acquiring many platinum discs, a Clio award win and two Grammy nominations. Ken has produced and engineered for some of the world’s biggest and best artists including The Beatles (plus solo projects by John Lennon, George Harrison and Ringo Starr), Elton John, David Bowie, Lou Reed, Harry Nilsson, America, Supertramp, Duran Duran, Jeff Beck, Mahavishnu Orchestra, Billy Cobham, Procol Harum and The Rolling Stones. Home to countless landmark recordings and pioneering advances in recording technology, the legendary studio complex has a phenomenal history spanning over 80 years, encompassing celebrated work by many of the world’s most famous recording artists including The Beatles, Pink Floyd, Kanye West, Elton John, Oasis, Elbow, Lady Gaga and Adele. Since the score for Raiders of The Lost Ark was recorded at the studios in 1980, Abbey Road has developed into one of the world’s premiere locations for movie scoring. Blockbuster films such as the Lord of The Rings Trilogy, The King’s Speech and Skyfall feature scores recorded there, while recent projects include the Oscar-nominated scores to Gravity and Philomena. Additionally, a number of high-profile video games such as Halo 4 and Call of Duty have recorded in-game music at Abbey Road Studios. The studios house a number of state of the art mastering suites. 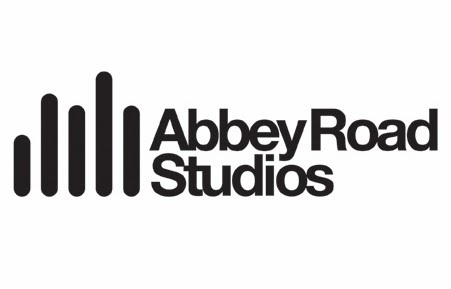 Recent projects mastered or re-mastered by Abbey Road’s award-winning engineers include albums by M.I.A, Johnny Marr, My Bloody Valentine, Ed Sheeran, Rizzle Kicks, Sophie Ellis-Bextor and the Virgin Records 40th anniversary celebration anthology.